The chapter descriptive ichnology includes several common and newly adopted self-explanatory terminology and morphological parameters to address geometric, preservational and genetic aspects of the lebensspuren produced by wide varieties of endobenthic invertebrates that are typical of the Sundarban mangrove ecosystem. Seilacher’s (Approaches to palaeoecology. Wiley, New York, pp 296–316,1964) and Matinson’s (Geol J Spec Issue 3:323–330, 1970) toponomic terms are useful in description and classification of bioturbation structures relative to preservation and occurrence within a stratum. Frey’s (J Sed Petrol 43:6–19, 1973) descriptive and genetic terms, such as tracks, trails, burrows, burrow system, shaft and tunnel, burrow lining, burrow casts etc., provide more clear picture of the traces. Simpson’s (The study of trace fossils. Springer-Verlag, New York, pp 39–54, 1975) morphological terms, such as prods, multi layered, simple trail, spiral, branched etc. are also in use to describe common invertebrate traces. 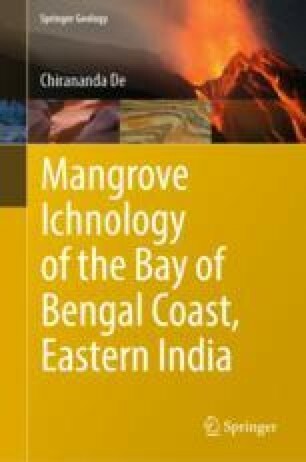 The author in the following sections has applied many of the above terms to describe present modern as well as preserved ichnological features of the Bay of Bengal coast. The organo-sedimentary structures produced by several genera and species of crabs thriving in the coastal and estuarine zones, polychaete Diopatra cupria, bivalves Tagelus plebeius and Macoma birmanica, gastropods Turritella spp. and Telescopium spp., sea anemoes and star fish, besides those produced by unknown organisms especially in modern and ancient dune sands, older clay and woodgrounds and biomats have been discussed here in details. Trace morphometry has been linked to sexual dimorphism, ontogenetic variations, hydrodynamic and other environmental parameters based on huge field database collected by the author over a few decades.